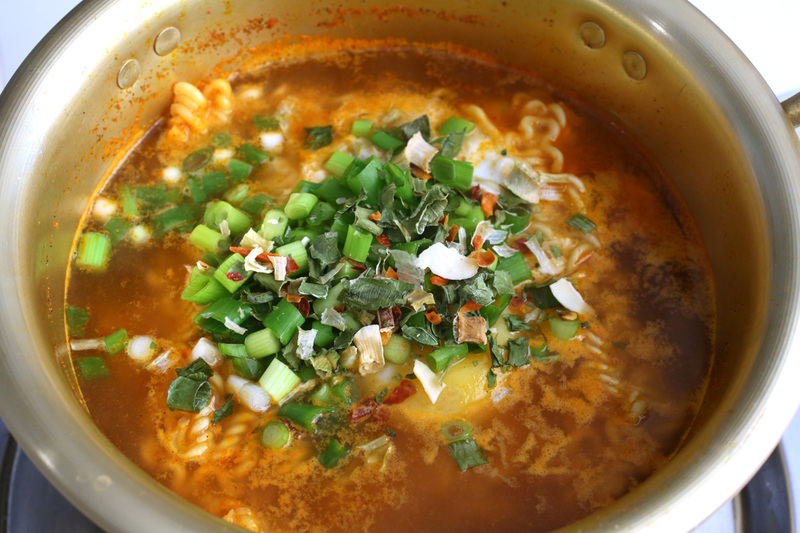 Today I’m going to show you a simple recipe that uses a package of Korean instant noodles, called ramyeon in Korean. Ramyeon is the Korean version of instant Japanese ramen. In Japan, ramen can be instant or fresh, but in Korea, ramyeon is always instant. A package of ramyeon comes with instructions on how to cook it, but I found my way of doing it is much better, and also uses some simple fresh ingredients to make it more delicious. The first time I tried it, I couldn’t believe how tasty it was, how simple it was to make, and how curly the noodles were! 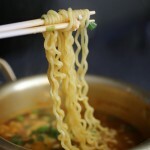 Korean noodles were all straight, so the shape of ramyeon noodles was unique. Over time I also came to realize that ramyeon was really junk food, similar to a bag of chips in the West. To tell the truth, I don’t eat ramyeon very often. However, a quick, easy, hot snack is hard to resist so when I travelled around the world as part of my Gapshida program, I always had some ramyeon in my bag. This way I could always make some hot food in any hotel room in any foreign country. One of the important tips in this recipe is the timing: the noodles shouldn’t be overcooked. When you start eating the ramyeon, the noodles will be curly and a little firm. But 3 or 4 bites later they will cook in the broth a little more and soften up to the perfect consistency. So don’t let them cook too long and let them get mushy before you start eating! If you’re still hungry after the noodles are done, you can add some rice to the leftover broth at the bottom of the pot to make a quick gukbap (soup and rice mixed together). I use a Korean tin pot in this video. Koreans like using these pots for ramyeon because they’re thin and light, heat up quickly, and are the perfect size for one package. We also use the lid as a place to cool down a mouthful-worth or noodles for a few seconds before eating them. The pot is a useful thing to have, but it’s not essential to make ramyeon: any pot will do. This video was filmed at YouTube Space LA. My guest cook was Jimmy Wong whose YouTube channel is Feast of Fiction. Jimmy said his mom makes Korean kimchi on a regular basis. I had a great time filming with him! Add the noodles and the included soup powder to the boiling water. Cover and boil for 1 minute. Open the lid and turn the ramyeon over with a spoon. 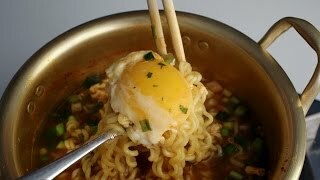 Crack the egg directly into the boiling ramyeon, and cover and cook for 1 to 2 minutes. Don’t stir, so the egg will be poached. Remove from the heat. Open the lid and add the green onions and the included package of dried vegetables. Serve with kimchi and rice. Posted on Wednesday, October 2nd, 2013 at 8:15 pm. Last updated on July 25, 2017. Posted December 20th, 2017 at 4:36 pm | Log in to reply. Posted July 19th, 2016 at 4:29 pm | Log in to reply. Posted December 21st, 2014 at 4:21 am | Log in to reply. Posted November 28th, 2013 at 12:48 pm | Log in to reply. I always keep 3 or 4 bowls of this in my desk at work for when I work late. Sometimes I will have them for lunch and add kimchi. 맛있어요! Posted November 27th, 2013 at 2:18 am | Log in to reply. Posted November 6th, 2013 at 5:45 am | Log in to reply. Hi Maangchi. I usually don’t like to eat ramyeon, but you make it look so good! I usually only like it when I am camping or out in the mountains…tastes amazing then. But at home, I rarely resort to it. But now I am craving some! Posted October 8th, 2013 at 4:16 am | Log in to reply. maangchi, do you have a favorite brand of ramen? i like nong shim. when i lived in nyc as a college student around 2001, i would buy 10 packages of nissin top ramen for $1 from gristedes. it kept me from starving! Posted October 6th, 2013 at 5:19 pm | Log in to reply. I love watching you and Jimmy together on YouTube. Jimmy is pretty funny on his own. I didn’t know he could sing! That was pretty funny video. Thanks for the laugh!! Posted October 4th, 2013 at 1:18 pm | Log in to reply. This is one of the funniest videos!!! That’s exactly how my mom used to make ramen for us back in Korea too! Wow…haven’t had Korean Shin-Ramen in…almost a decade now. Now that you inspired us I’ll have to go shopping for some ramen! My neighbor gave us lots of fresh eggs from their hens so I can make really good ramen with good eggs! Posted October 5th, 2013 at 7:45 pm | Log in to reply. I’m so happy to hear that this video made you laugh! : ) “My neighbor gave us lots of fresh eggs from their hens so I can make really good ramen with good eggs!” awesome! Posted October 3rd, 2013 at 4:08 am | Log in to reply. I love Ranyeon and add lots of ingredients to it :D My fave adds are: (fresh cooked) spinach, mungbean sprouts, bamboo shot slices, zuchini, radish sausage slices and very important a raw egg (or two ^^). Posted October 5th, 2013 at 7:43 pm | Log in to reply. 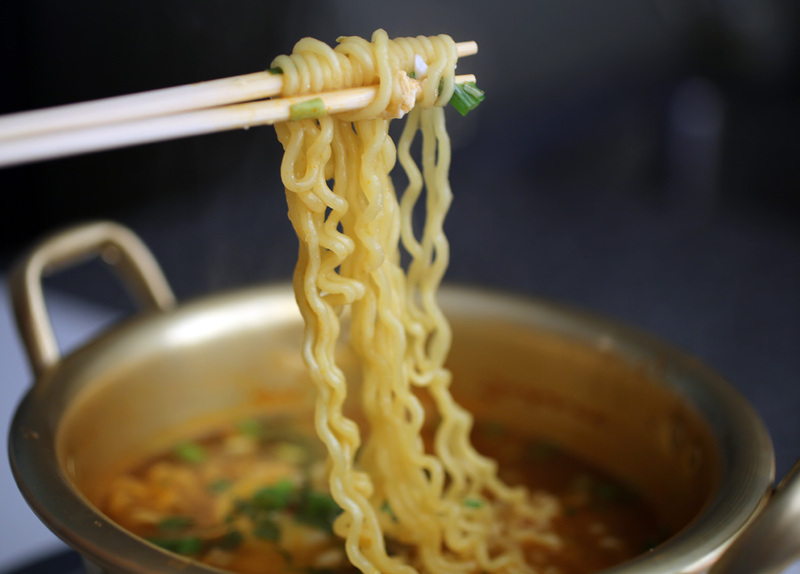 Your way of making ramyeon sounds fantastic! This recipe was originally posted on October 2, 2013 at 8:15 pm by Maangchi. It was last updated on July 25, 2017. The video was watched 5,178,975 times on YouTube & has 63,762 likes!